Before the wedding come the Engagement story. How did I ask her to marry me? Why by hiding the message on a PCB she designed! After we sent them off to be fabricated, I contacted the PCB pool coordinator and asked him to add some text the the silkscreen. When Mara got ready to populate the boards, she found the message of a lifetime. Then it came time to design our wedding invitations. We decided to take our wedding theme (circuits and swirls) literally by creating invitations with actual circuits on them. Completely hand crafted, we used a solid ink printer to make flexible circuit boards at home and added an ATTiny13 and some LEDs for a sparkling effect. Bonus, there’s an Easter egg in the code! A ‘Wishing Well’ at a wedding is a tradition where guests write well-wishes for the couple. We decided to make a well that did more then just sit there by adding some light and sound effects. Combing an Arduino, an inexpesive music player, an PWM shield, and a 3D printed latch, the well puts on a quick show every time a ‘wish’ is deposited. To keep ourselves on budget, we ended up designing and 3D prinitng our own unique table centerpieces. 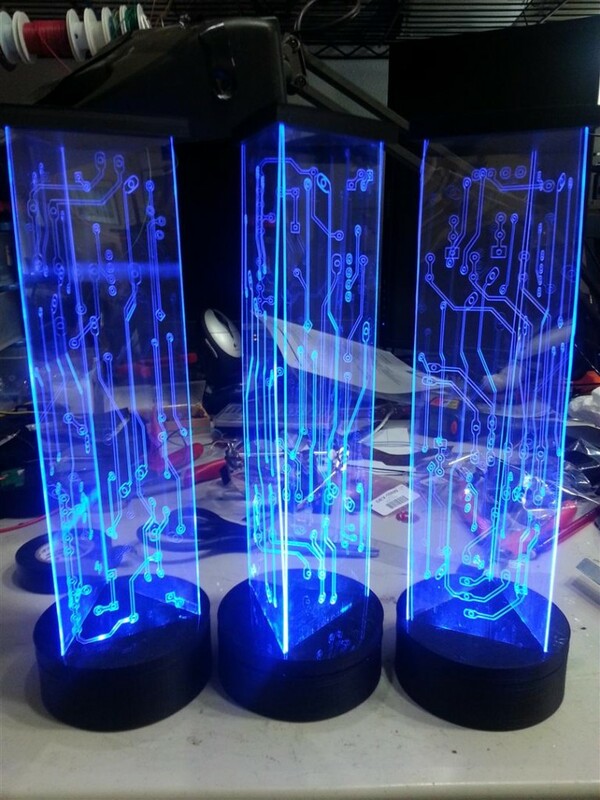 Using a Makerbot 3D printer and a Silhouette cutter, these centerpieces are completely DIY. When it came time to think about our wedding attire, did we keep to tradition? Of course not! 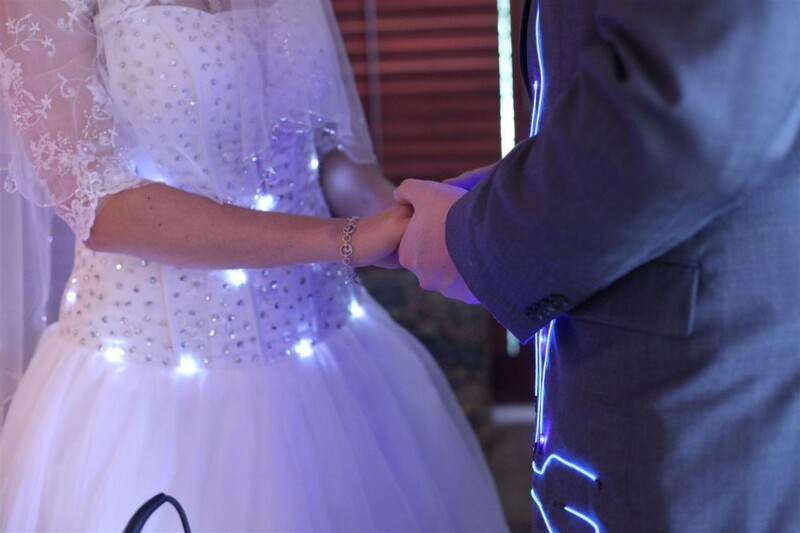 Instead, we added LEDs and EL wire to our outfits. To keep bulges low, we had to re-purpose EL inverters for standalone operation. 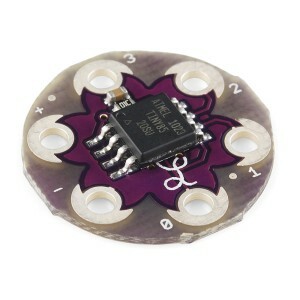 We also used inexpensive LilyTiny’s to run 12 LEDS with 4 IO pins. 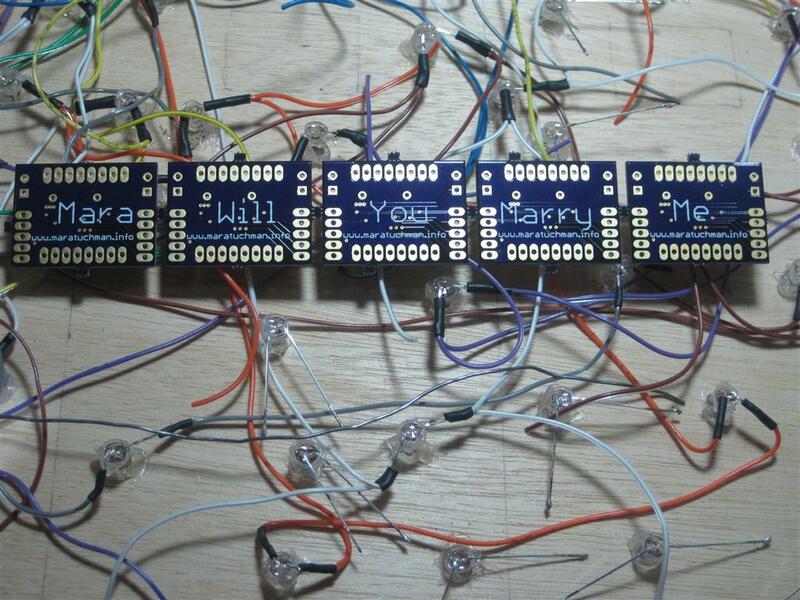 Not content with tradition wedding vows, we came up with our own wedding ceremony involving a soldering iron and LED display. Bonus: it used the same boards I asked Mara to marry me on! 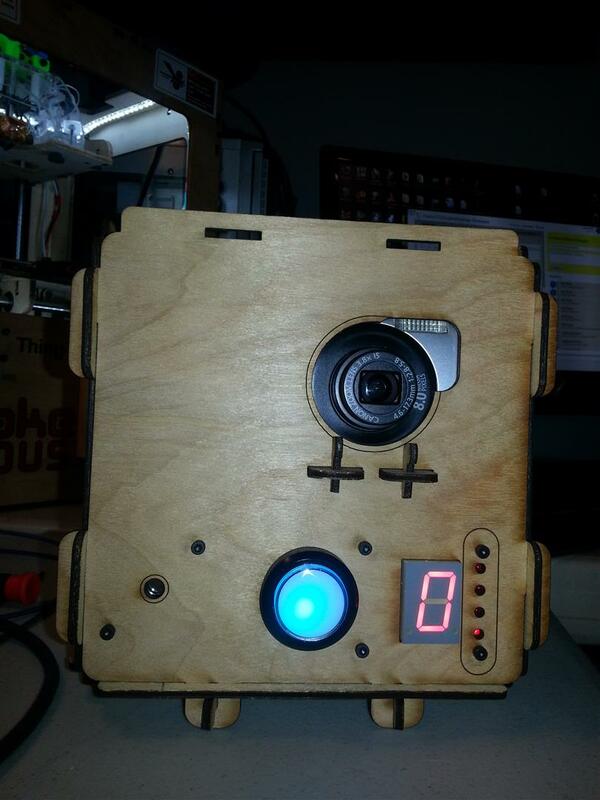 We took a Photoboop kit and added a RGB button and some sounds to attract the attention of our guests. 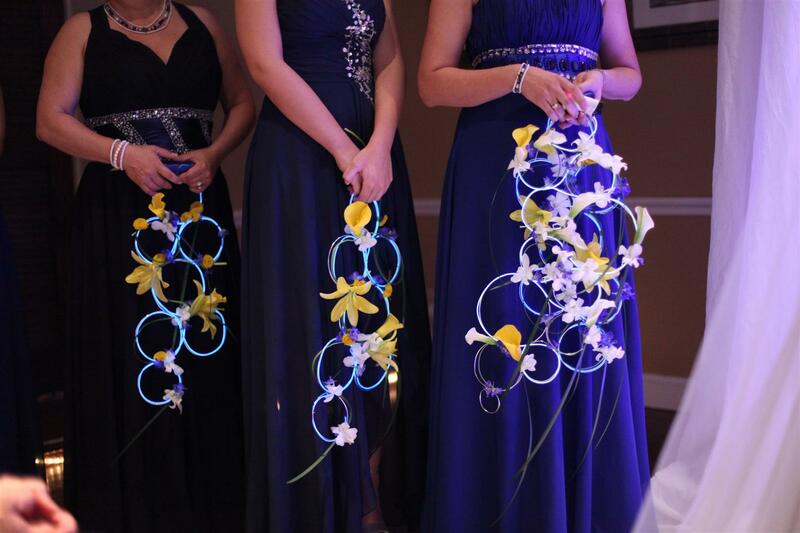 Mara worked directly with the florist to design unique bouquets complete with 3 meters of EL wire each. Mara and my mother worked together to create unique jewelry with resistor and PCB elements from old print cartridges. 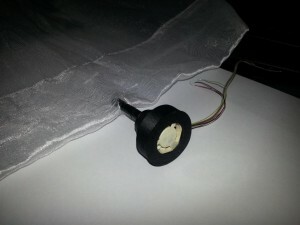 We created a few new and different technologies during the creation of our various wedding projects. First is Vixeno, an easy way to embed Vixen light shows in AVR code. Next is code for a Charlieplexing display powered by a LilyTiny, ATTiny85. Even though we didn’t end up using it, we came up with an easy way to light up small fiber-optic sheets available from Sparkfun. Some of the best photos from the wedding can bee seen in this Flickr slideshow. 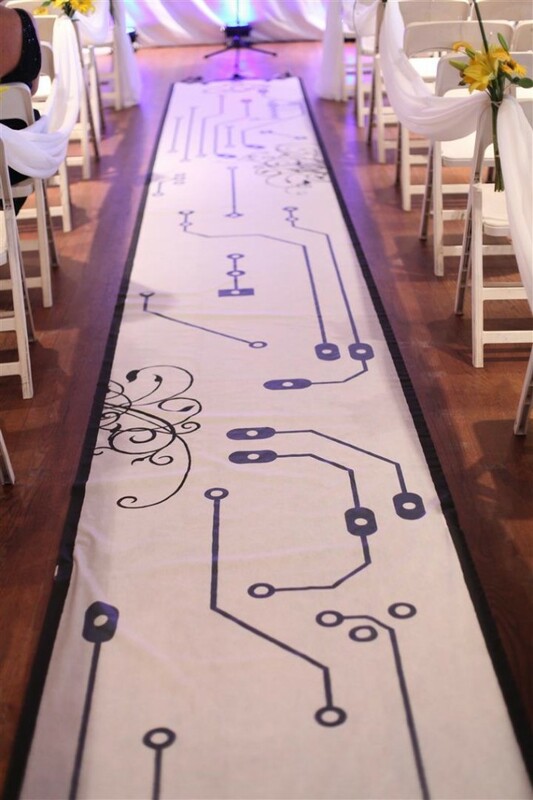 Thanks for sharing your geeky wedding. Looks like you put in a lot of work together as almost everything had a personal geeky touch from you two. 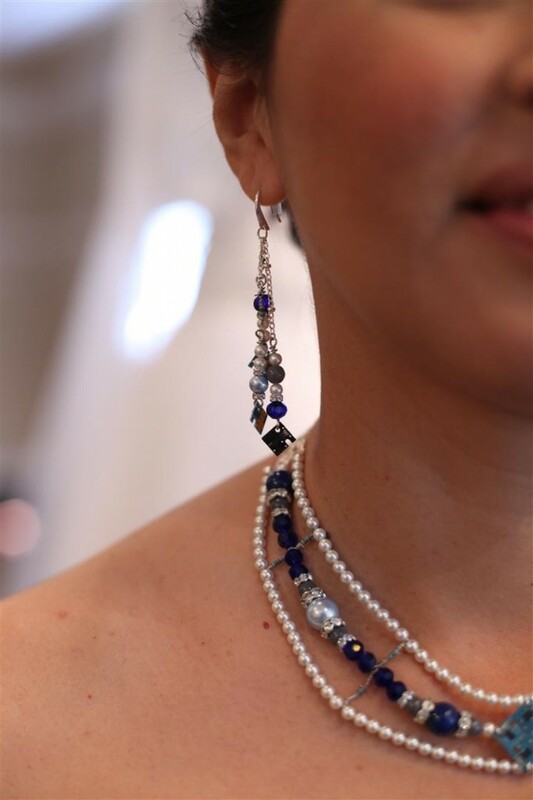 It’s something different and refreshing compared to those classic (and sometimes boring) weddings. Best of luck to you both. Guys, you are awesome! What an amazing set of projects, all centered around a common theme. I love it when a wedding shows so much attention to detail everywhere. Great, incredible job!